The film includes footage of Greenbank pupils, interviewing local councillors, Cycling Officers, teachers, and the town’s MP. It also includes cycling skills on the roads in and around Southport, bike maintenance, health reasons why we should cycle and many more. The girls met and interviewed a teacher and assistant head from Holland to see how many children cycle to school in Holland and now have a link with the school thanks to Andy from North City Learning Centre. The girls have started there own bike club called Pedal Power the Way Forward and have regular cycle sessions at lunchtime and after school. 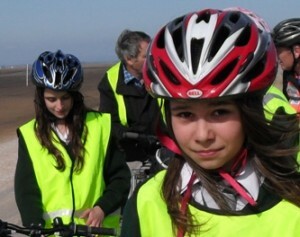 Greenbank high school is also taking the lead on the young people’s cycle forum in Southport. The Forum was set up by Greenbank and Juliet Jardine the CTC cycle Champion to make sure young people’s voices are heard in Sefton. Young people have a right to say what they think should happen, when adults are making decisions that affect them. The pupils met in Southport Merseyside to discuss the issues that young people have with cycling, they met with officers from the Cycle Town Project team, Head teachers and Cycling officers. The meetings are an opportunity for young people to get together, discuss and get involved in issues that affect them. The young people came up with some great ideas on how to make Southport a safer place for them to cycle, how to make school routes a safer place for them to cycle and how to encourage young people to cycle to school. Some of the girls have gone on to cycle with Southport’s women’s cycling Belles and are now leading some of the rides and learning life long skills. This entry was posted on Wednesday, February 2nd, 2011 at 5:36 pm	and is filed under Scheme of the month. You can follow any responses to this entry through the RSS 2.0 feed.